Lang 4wd Spindle Puller can remove front spindle to access needle bearing when lubricating and aligning front wheels. 5/8-18 fine thread permits use with slide hammer.Fits spindle thread sizes 2- 16, 1-5/8-16, and 38mm-1.5 Applications: Full-size GM, Ford, Jeep and International pick-ups with Dana front axles, plus Ranger and Bronco II. Lang 4wd Spindle Puller is designed for use with a torque wrench when servicing truck wheel bearing lock nuts. Not to be used with pneumatic power tools. The 3910 Lang 4wd Spindle Puller is one of thousands of quality tooling products available from MRO Tools. Please browse Lang Automotive Axle Nut Sockets for tools similar to the 3910 Lang 4wd Spindle Puller. 3910 Lang 4wd Spindle Puller description summary: Lang 4wd Spindle Puller. Removes front spindle to access needle bearing when lubricating and aligning front wheels. 5/8-18 fine thread permits use with slide hammer. 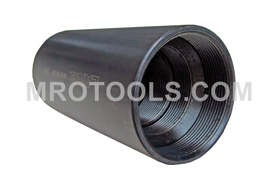 Fits spindle thread sizes 2- 16, 1-5/8-16, and 38mm-1.5. Quantity discounts may be available for the 3910 Lang 4wd Spindle Puller. Please contact MRO Tools for details.